A member of the Court of King James VI (1566-1625), knighted in 1609, appointed Secretary of State for Scotland in 1626, created a Viscount in 1633 and Earl of Stirling in 1639, Sir William Alexander was granted from King James VI, by way of Royal Charter, the land from Newfoundland to New England, including the area occupied by the current provinces of New Brunswick and Nova Scotia, and the Gaspe Peninsula. Like all important state documents of the day, the Royal Charter given to Alexander was written in Latin, and hence the name "Nova Scotia" was used to describe the territories of New Scotland. As an incentive to attract settlers to his new land, Alexander devised a scheme with the support of King James VI to give the title of Baronet of Nova Scotia to anyone willing to purchase, secure and settle large grants of land in Nova Scotia. Under Scottish Law the Baronets "took sasine" in Nova Scotia by receiving symbolic earth and stone from the actual land. To allow for this ancient ceremony a small parcel of land at Edinburgh Castle was deemed granted to Sir William Alexander as part of Nova Scotia; and hence, the Baronets were installed there while standing in Nova Scotia. The parcel of land at Edinburgh Castle granted to Alexander and part of Nova Scotia still exists, and in 1953 the Hon. 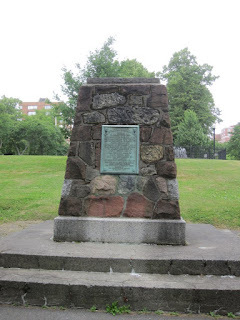 Angus L. Macdonald, then Premier of Nova Scotia and Past-President of The Scots: The North British Society, unveiled a plaque in that very spot, commemorating the Baronets of Nova Scotia. In 1957, stones from the steps of Menstrie Castle, the birthplace of Sir William Alexander, were taken to create this monument that stands in Victoria Park, in recognition of Alexander's role in the creation of "a New Scotland in the New World."